Blog / Just in from Pedalino Bicycles! Just in from Pedalino Bicycles! Julie Pedalino, owner and proprietor of Pedalino Bicycles in Lenexa Kansas is a RhinoCAM Professional user and one of just a handful of female bicycle designers and frame builders in the world. Julie is a regular contributor to the MecSoft Blog and just shared with us this fine example of design and craftsmanship in her latest bike frame build project. 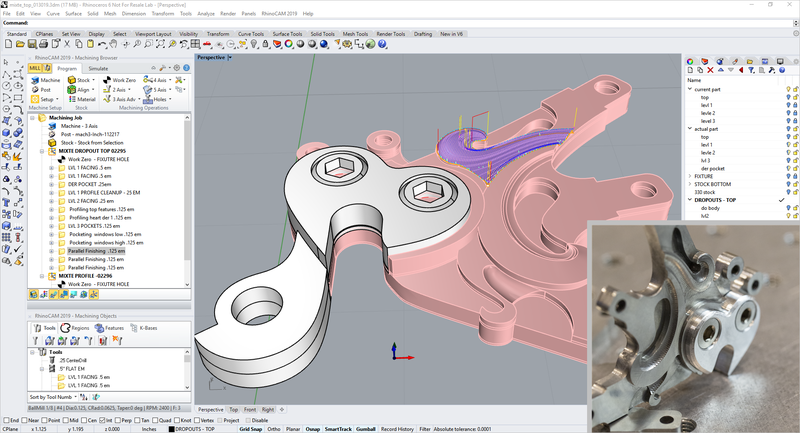 Shown below is Julie’s Rhino 3D design and sample RhinoCAM toolpaths for a set of 17-4 stainless steel vertical dropouts with replaceable 2024 aluminum derailleur hangers. These dropouts are somewhat unique because there are three stay tabs instead of two. This is because the frame that the dropouts are going on is what is called a mixte frame, which is a type of step-over frame with twin lateral top tubes that connect the head tube directly to the dropouts instead of a single top tube that connects the head tube to the seat tube. 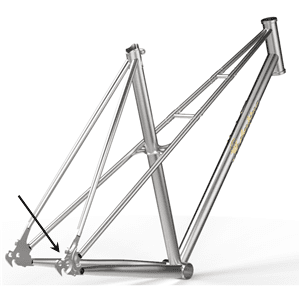 A rendering of the frame design is shown below. 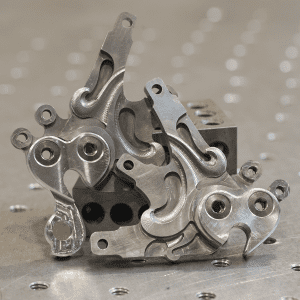 Julie’s design is quite a machining job incorporating a complex mixture of 2½ Axis Facing, Pocketing and Profiling in multiple levels coupled with 3 Axis Parallel Finishing in the sculpted filigree areas. 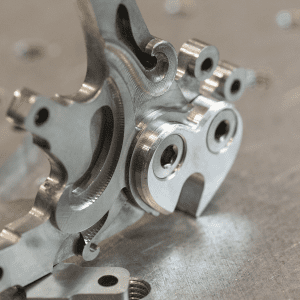 Shown in the RhinoCAM display below is one component in the set of two machined at the same time. The Rhino 3D design is shown with the first of three 3 Axis Parallel Finishing toolpaths displayed. 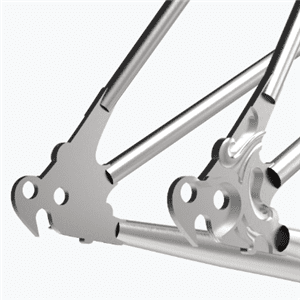 The replaceable aluminum derailleur hanger is shown in white. The completed component is shown inset. Here are rendered images of the mixte frame and vertical dropout designs. 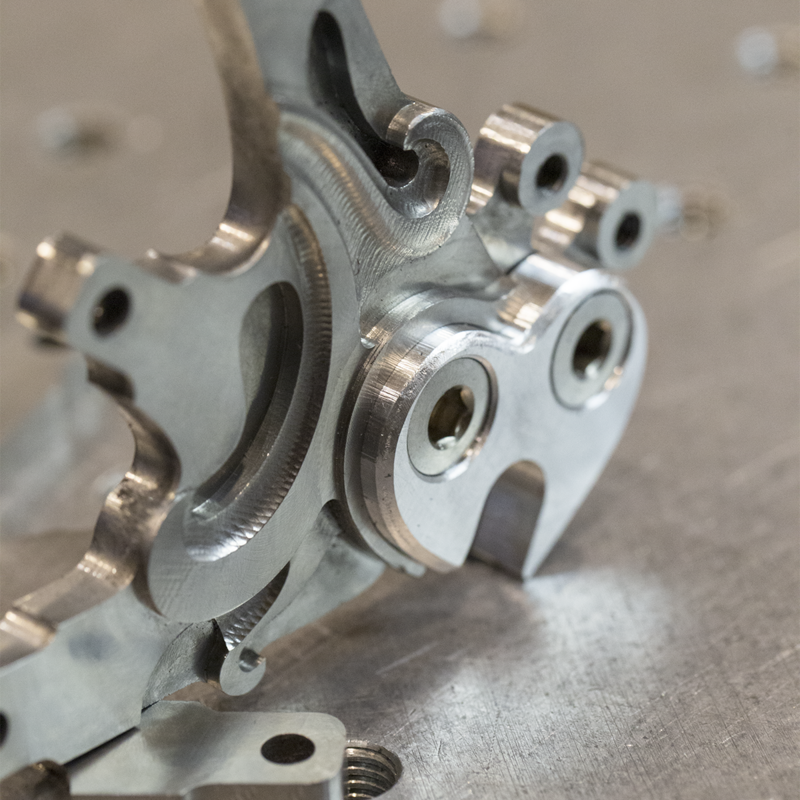 Here are some additional close up images of Julie’s machined components. The image on the top-left shows both drop outs, one with the replaceable aluminum derailleur hanger. 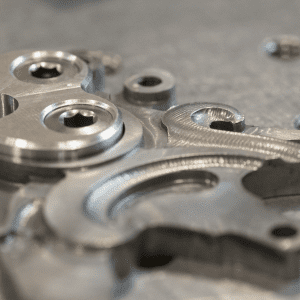 The image on the top-right shows the 3 Axis Parallel Finishing toolpath with visible stepover cusping incorporated into the texture of the design. For more information about Pedalino Bicycles we invite you to visit them online at Pedalino Bicycles on the web and on Facebook and Instagram. For more information about RhinoCAM Professional we invite you to visit the RhinoCAM product page.